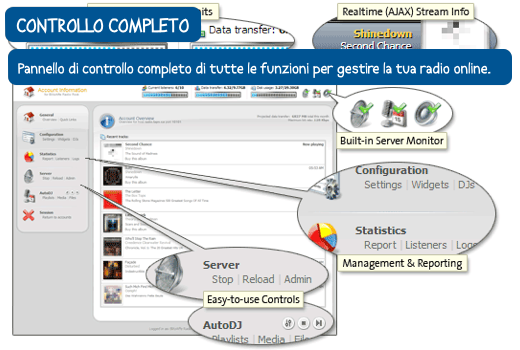 The best AutoDJ system ever for creating your own web radio stream with Centova Cast 3.2, further improved and enhanced by many features. 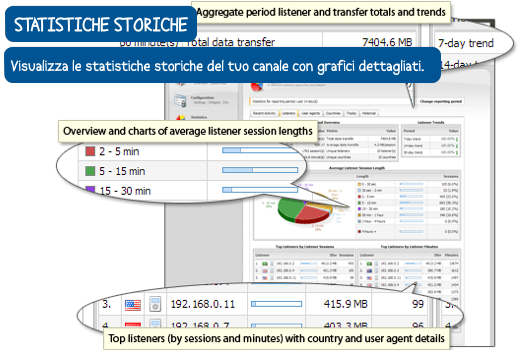 A SHOUTCAST 2 or ICECAST 2 server up to 100 contemporaneous listeners on your Internet radio station (subdivided onto different lines (mount points) as you see fit). Encode streams directly into MP3, AAC+ and OPUS up to 192k total bitrate (OPUS encoding is only available on Icecast servers). Multiple encoding into different formats is possible (for example the same server can be heard in 128k mp3 and 32k AAC+) and up to 2 independent mount points are included in the fee. With the same server, for example, you generate a flow in mp3 at 128k and contemporaneously at 32k in AAC+ for mobile devices. You can mix between tracks (configurable in transition sections and fade-in / fade-out regulation). Re-encoding mp3 files (the files do not have to have the same bitrate). Fifteen (15) gigabytes of disk space to upload your songs, jingles, commercials and programs form your Internet radio station. Upload files directly from the file manager in the control panel or via FTP. A real, complete online AUTOMATION software for transferring and programming all of your music, jingles, commercials, programs. Also available in Italian. 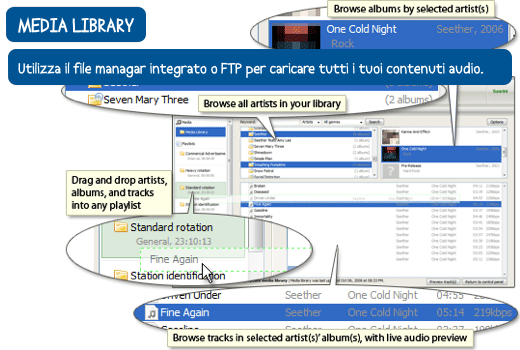 Automatically displays covers through the iTunes, Amazon and LastFM archives. 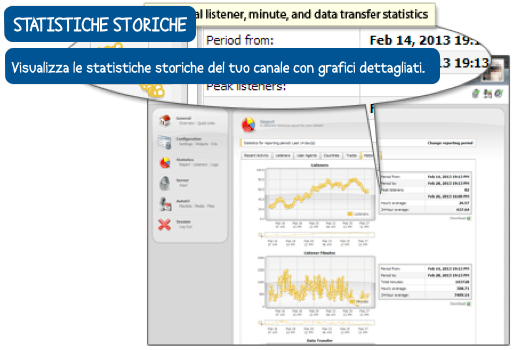 A page for your Internet radio with links for listening, statistics, songs on the air and their album covers (to be used for testing the service and not as a definitive site). 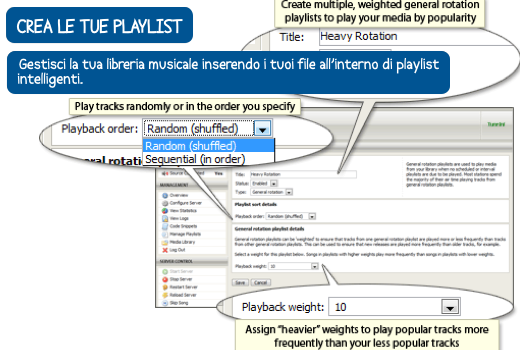 Automatically create HTML code to display a number of widgets on your site as author and with your title, broadcasting the last songs, album covers, statistics etc. 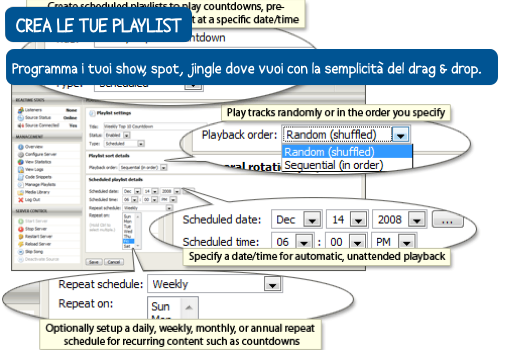 Do you want to learn how to use your streaming server with AutoDJ? While using an AutoDJ for your programming on a 24-hour basis, you can start a live stream anytime from a studio or on location. You can create one or more DJ accounts to which you can assign different levels of administrative power for managing the channel; every DJ can automatically connect to the server at the times you allot to them via an identification check, smoothly transitioning into the schedule and live broadcasting an event or program. Listeners will not be disconnected during the transition. At the end of the live recording, Easy Radio will automatically resume with the scheduled program. This configuration costs ONLY € 25 per month VAT excluding. During the ordering process, you can purchase additional options such as a higher number of slots (contemporaneous listeners) and /or more disk space for your audio files. You have a shop or a small business and you want to create your own unique customized music. You have a commercial or amateur website and want to add an Internet radio station to your pages. You have a band or you are an artist who wants to start an Internet radio station with your music at a promotional level. 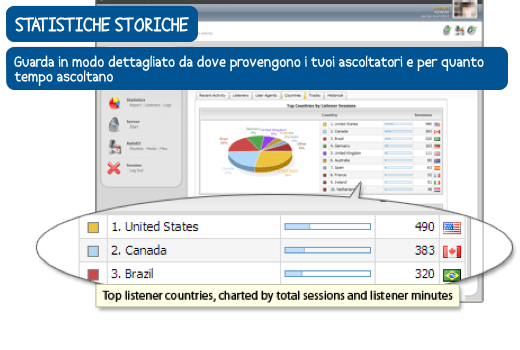 You are an association that wants to spread your voice via Internet radio. 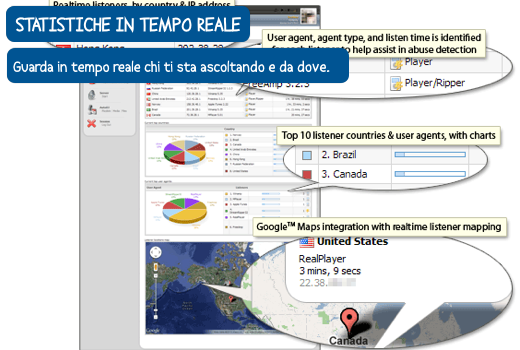 A simple and intuitive user interface in Italian lets you to quickly create an Internet radio station according to your needs. You do not need to keep a computer running and connected to the Internet to stream the channel. Once you download the file via ADSL and have programmed it with the online software, you will be on the air on a 24-hour basis without interruption. The monthly rental of the online platform does not include any fees provided by the SIAE and SCF concerning the protection of copyright and related rights. Each individual user, if necessary, will decide independently how to be regularized with the required licenses depending on the type of service that will implement advantage of our platform.